Question: I had LASIK surgery January 9, 2015. I am 38 years old. My vision was perfect when I left the LASIK surgeon’s office with the exception of halos at night. Three weeks later, I noticed my vision has decreased to the point of squinting at the TV. Is this normal? My contact lens prescription before surgery was right eye -7.00, and left eye -8.00. I was told I had a mild astigmatism in my right eye. My right eye seems to be worse than the left. Is this correctable? I'm not scheduled to see the doctor until April. I'm not sure I can go that long without being able to read at a distance. Answer: Unfortunately you do not relay any quantative data regarding your LASIK 1 day post operative uncorrected visual acuity, your 1 week or your actual 1 month data so it is difficult to know if and exactly how much you vision might have decreased. Your need to “squint” is all we have to go on. This suggests some decrease but it isn’t a good measure-and the amount of decrease is somewhat important. Now, you should know that your eyes are not thoroughly healed and visually stable after LASIK until about 3 months after the treatment. It is not until the three month visit-or in April in your case, when any decision about the need for an enhancement is properly made. Until that time the healing process does often result in some mild variation and shifting BUT you need to go and see your LASIK surgeon NOW as it is important to make sure the healing is going as planned. Sometimes, in the case of young, highly myopic people it might be necessary to use anti-inflammatory drops for a slightly longer period and rarely, but sometimes there might be other factors influencing the healing of the flap that can cause a decrease in vision. Thus, you should go back for a follow up visit ASAP and have the surgeon determine the amount of decline and the reasons and then prescribe or offer anything necessary. Question: I had LASIK Surgery about 15 years ago and now my vision seems to be less than 20/20? Can I have it again? Answer: Whether or not you can have a LASIK enhancement really depends on why your vision has decreased and the overall status and health of your eyes. If you have become more nearsighted, your doctor needs to understand the reasons. If it is due to some regression of the LASIK treatment-which is not common-then this needs to be considered as well. Most importantly the health, shape and thickness of the cornea need to be considered. After ruling out any other contributing eye health factors then if the decreased vision is due to a refractive error your LASIK surgeon will be able to advise you of the possibility of an enhancement. Your best next step is to schedule an exam and consultation with your LASIK surgeon. Question: Can someone diagnosed with Ehlers-Danlos syndrome have LASIK surgery? I have a tough time reading and have astigmatism. Answer: Ehlers-Danlos Syndrome is an inherited connective tissue disorder that is caused by a defect in the structure, production, or processing of collagen or proteins that interact with collagen. Typically patients with EDS can have many corneal problems due to biomechanical weakness from a thin cornea and defective collagen. Even if there appears to be a regular eye surface topography, in general all types of EDS remain a contraindication to laser refractive surgery such as LASIK. To find out for certain if LASIK in your case is possible you should schedule a consultation with a LASIK surgeon who is a corneal specialist. Question: I had LASIK surgery on one eye to correct my distance vision a sort of monovision LASIK. This allowed be to stop using glasses for several years. But now my near vision has deteriorated to the point that I am wearing reading and computer glasses. 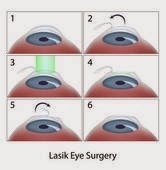 Is it possible to have LASIKsurgery on the other eye to correct the near vision issues and again dispense with the glasses? I had astigmatism in both eyes but that was corrected in the eye that underwent the first LASIK treatment. Is there a better alternative? I have not had any indications of cataracts. I have been treated for glaucoma in the past but discontinued treatment after I stopped running. The pressures have been good without treatment and are checked annually. Answer: Correcting your untreated eye will not allow for better near and intermediate range vision-in fact it will make it worse. You do not indicate your age, but even without cataracts you may want to consider lens replacement surgery in order to have multifocal lens implants that might solve your near vision issue. LASIK will not accomplish this for you. Your best next step is to have a consultation with a refractive surgeon who is also a cataract surgeon and share your needs. To learn more about Eyecare Medical Group in Portland Maine, LASIK, corneal diseases, conditions, problems & surgery you may visit the new web site at www.eyecaremed.com.